Shabestan is an authentic Persian restaurant located in Singapore riverfront district, Robertson Quay. Helmed by Executive Chef Hamid Hosseini, Shabestan served authentic Persian cuisine that combines premium halal lamb, beef, chicken, fish with Persian’s finest ingredients like saffron, olive oil, pomegranates, prunes, raisins and nuts. To celebrate World Vegan Month, Shabestan launched a new vegetarian and vegan menu as part of its Persian Green Month. This special menu offers healthy, plant-based dishes for vegetarians and health-conscious diners. It is available until 15 December 2018. We started the tasting with Appetiser Platter ($35). Consist of Hummus, Homemade Cheese, Muhammara, Kashk-E-Bademjan, and Borani Esfanaaj; Served with Persian Bread ($3). The Persian Bread is just awesome. 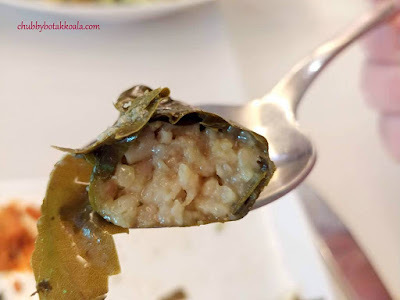 It is crisp, light, fragrant with a slight chewiness in it bodes well with all the appetizer. I like the homemade cheese (creamy with a touch of twang), Muhammara (bursting with flavour from roasted bell peppers and crunchy pomegranate) and Borani Esfanaaj (an aromatic mixture of fried onions and spinach) as they suit my palate. Shirazi Salad ($12), a combination of freshly chopped cucumber, tomatoes, onion and house dressing. It is crunchy, juicy and refreshing. The acidity in the house dressing is very strong, and it helps to open up your appetite. It is also good to consume with your main meal, as the acidity helps to balance any overwhelming flavour from the main meals. Dolma ($9), a stuffed mixture of rice, split yellow peas, savoury herbs used as a filling, wrapped with grapevine layers. Persian version of rice dumpling tasted like rice and peas wrapped in cassava leaves. Good for small bites, a prelude to the main meal. Mirza Ghasemi With Egg ($25) - Northern Iranian grilled eggplant with garlic, tomatoes and spices. It also comes without Egg for Vegan. The eggplant is grilled and cooked until soft, infused with garlic, tomato and spices. The garlic flavour is very strong here, however, the sweetness from the fried onion and tomatoes really perk up this dish. I personally like to have it with Persian bread. Ghormeh Sabzi Vegetarian ($29) - A savoury medley of fresh herbs, cottage cheese cooked with red beans, sun-dried lime and fresh vegetables in Persian spices. It reminds me of Palak Paneer, the spinach and feta cheese in Indian cuisine. However, the version here is different, it is cooked for close to 4 hours, allowing it to extract the essence of the herbs. The cheese added a chewy texture and umami flavour to the dish. For me, it is definitely a “rice thief” dish. Assorted Rice ($10 each), Baghala Polo (rice, lima beans & fresh dill); Zereshk Polo (wild barberries, fresh pomegranate and saffron flavoured basmati rice); Javaher Polo (basmati rice mixed with Persian nuts, berries & sun-dried orange peel). Javaher Polo (Left); Zereshk Polo (Top); Baghala Polo (Right). I like the Bagholo Polo as suitable to go with the savoury or main dishes, while the Zereshk Polo and Javaher Polo are more like a rice salad, due to the sweetness and nutty ingredients in the rice. Sabzi Kebab ($25), served with Basmati Rice and Bagholo Polo. Chef's recipe charcoal grilled vegetarian kebab with seasonal fresh vegetables & homemade cottage cheese. The grilled vegetables are aromatic and nicely charred. The homemade cottage cheese is springy and delicious. Dessert is Persian Saffron Ice Cream ($8). It is homemade with pistachio, cream and saffron. Not a straightforward pistachio ice cream, I feel the combination of cream and saffron are too strong for my liking. Persian is known for their tea. I manage to try Persian Tea, served with saffron sugar. 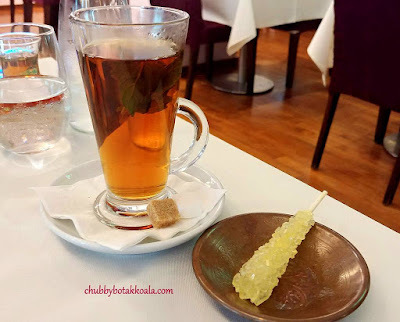 Fruity and aromatic tea, infused with mint leaves. The saffron sugar adds a touch of class in the tea. True to its identity, Shabestan restaurant décor exudes Persian characters in each corner. You can be forgiven if you think you are dining in Persia instead of Singapore. Overall, the dishes in Shabestan have its own unique characteristic. 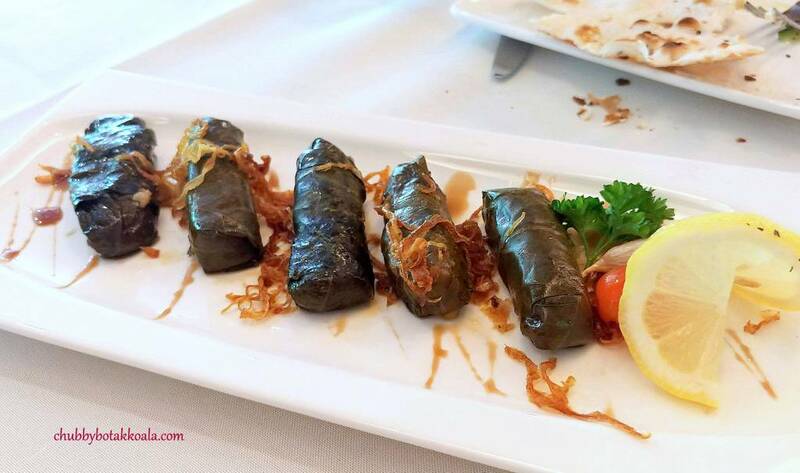 Although some dishes might look similar to other Mediterranean restaurants, it definitely has a distinct taste. Don’t miss out on Persian Green Month at Shabestan. Cheers!! Thank you very much to Shabestan’s Team and Catherine Ong’s Team for the tasting invitation. For Shabestan Persian Green Month Menu, click here.